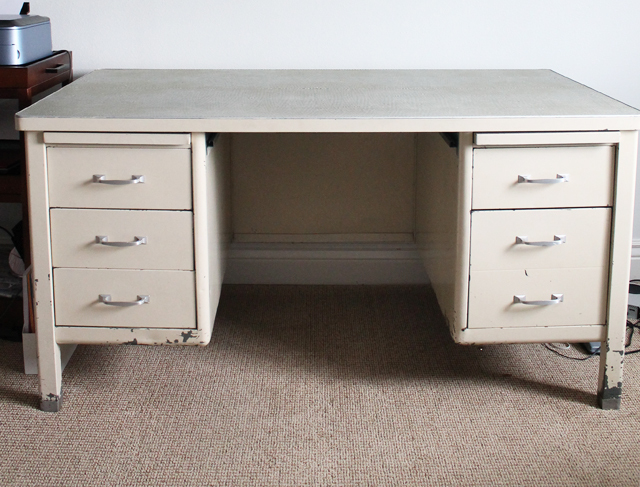 Transform a vintage metal desk with Chalky Finish paint from Americana. 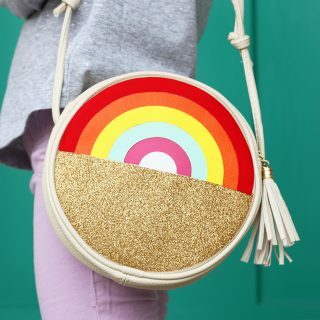 This post is sponsored by DecoArt, but the project and opinions are 100% mine! I have a love for vintage items. So when I found this mid-century metal desk at a rummage sale a few years ago, I knew it would be mine. I bought it for $20 and left it there until I could figure out how to get the beast home. (These desks are HEAVY by the way.) When my husband finally got it in the house, he vowed he would never move it again. Three years and one house later, here she is. The paint is chipping off everywhere and it’s not a very nice color. 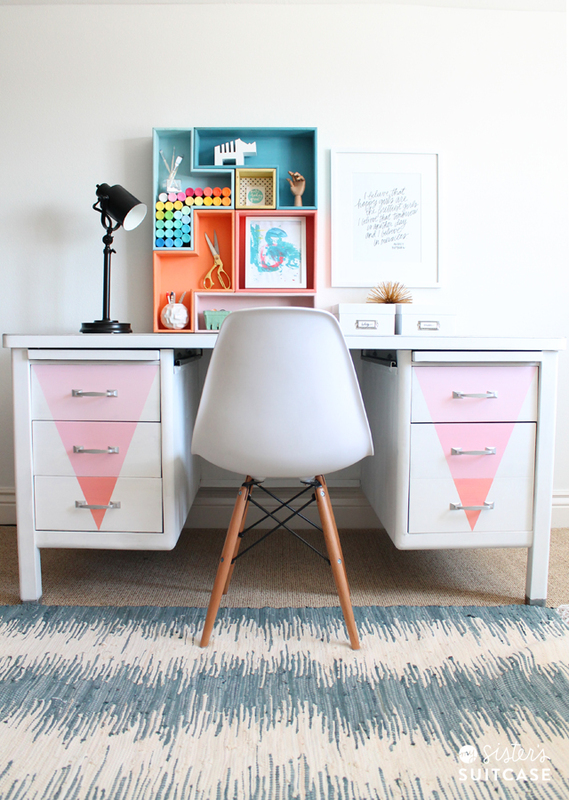 I use this desk every day, but I never thought about painting it until I started seeing all of the awesome furniture makeovers people had been doing with DecoArt’s Chalky Finish paint. This paint is so universal. You can use it on wood, walls, glass, metal, and more! I had never attempted it on metal so I decided to give it a try! 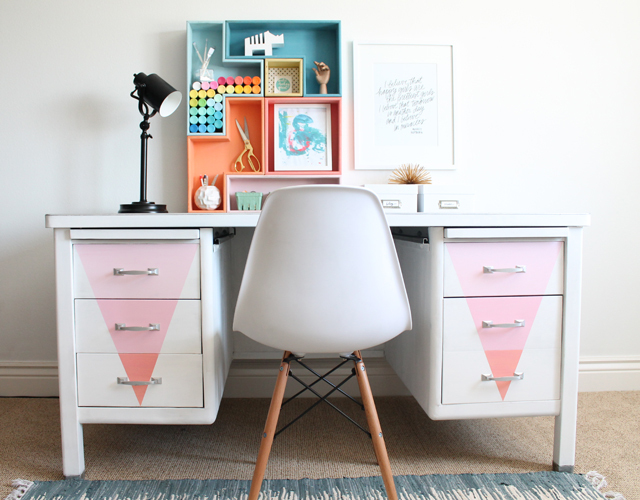 I knew I wanted the desk to be white, so I used DecoArt’s Chalky Finish paint in Everlasting. To add some graphic interest on the drawers, I created a pattern with the pink color Innocence, and custom color mixes of Everlasting, Innocence, Smitten, and Romance. Step 3: In between coats I sanded the surface with fine 220-300 grit sandpaper to help reduce brush strokes and create a smoother finish. Make sure to wipe down surface or vacuum after sanding! 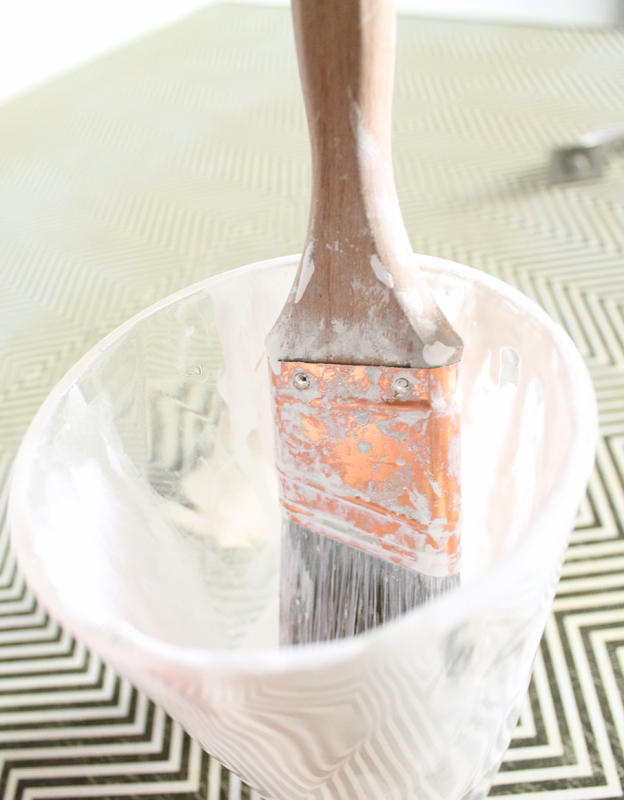 *Chalky Finish painting TIP: If the paint is going on too thick and creating a lot of brushstrokes, dip your brush in water after you dip in your paint. This helped to make my third coat extra smooth. 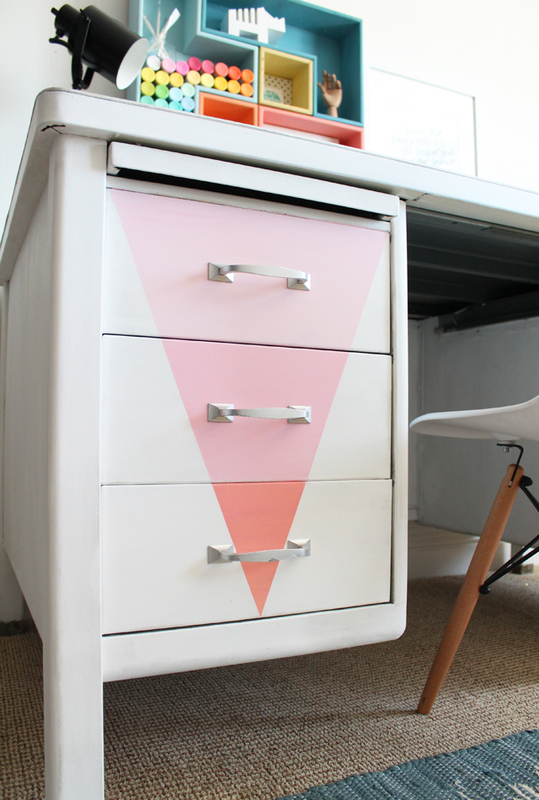 Step 4: Once the desk was white and pretty, I decided to add a triangle pattern on the drawers. I taped off my pattern with masking tape. Then I painted each section with a different shade of pink. (The middle drawer is Innocence, the top drawer is a mix of Innocence and Everlasting, and the bottom color is a custom mix of Innocence, Smitten, and Romance.) This only took one coat! Step 5: Once the pattern was dry, I removed the tape, and sanded the surface just slightly to smooth it out. Step 6: I finished off the project by adding a few coats of the Americana Decor Soft Touch Varnish. I decided on this product, rather than wax, because it is really durable to withstand little fingerprints and it gave me the finished look I wanted. Step 7: I re-attached the hardware and stepped back to enjoy the finished result! I am so happy every time I look at this desk now. Or sit at it. Or just walk in the room. 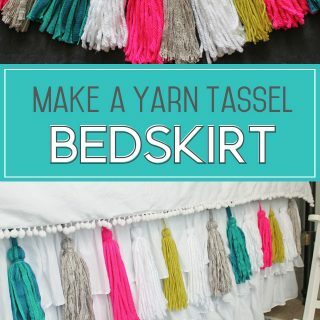 Why didn’t I do this three years ago? If you have a piece of furniture sitting around that is begging for a makeover, what are you waiting for? DecoArt is hosting an awesome contest right now and you can enter your furniture makeover for a chance to win $2,000 in cash and other amazing prizes. 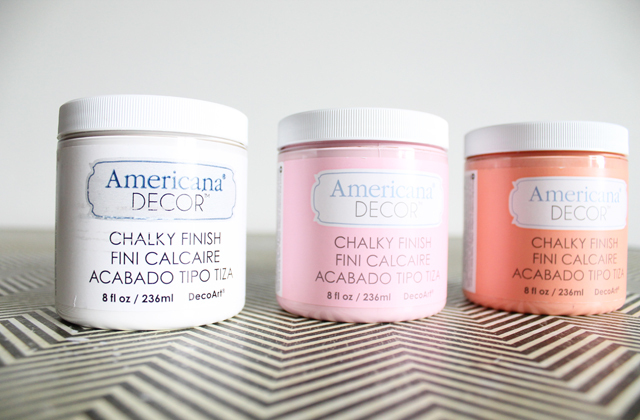 Visit the DecoArt Chalky Finish website for more paint ideas and inspiration! What a great transformation! I love the ombre look you got with the color variation in the triangle. Very modern and sweet. Nice job! This is so cute! I never would have thought to paint a metal desk. I don’t know why! Wow, I love what you did with this desk! Love love this!! You did an awesome job. The triangles are such a great touch. Where did you get that shape shelf on the desk? Beautiful job! I love the color combo and the geometric design. I will have to try this paint on metal! Love how it turned out. What did you do with the top? Do you mind me asking where you picked the chair up? The whole set up is awesome!!! Love, love, love!! Who knew a metal desk could look so gorgeous! I adore this project so much, but my big question is about the Tetris-eqsue shelving organizer on the desk. Did you make those yourselves or did you purchase them and paint them? I was trying to find them on your blog. Thank you so much for your time. Holly found those shelves at TJMaxx/Home Goods! 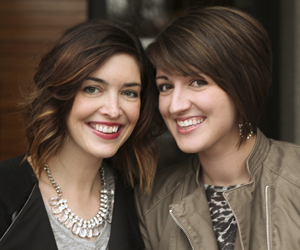 They are SO cool! 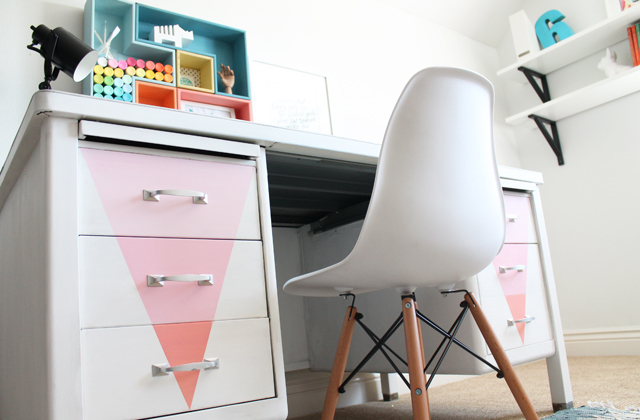 Currently researching new designs and fun ideas for my metal desk I’m doing a tutorial on later! I love how y’all’s came out! Thanks for the inspiration and help!